It's Independence Day weekend but, never fear, new products are still abound! Tomorrow is Independence Day for everyone here at SparkFun, like everyone else in the United States. Luckily we made sure we had some new products available before we leave. We are pleased to announce that the shield add-ons for the Photon module are now available for purchase! Needless to say, we are very excited to be able to start shipping these out to get them into your hands. Let's go ahead and take another look at the awesomeness of the Photon ecosystem! Preorders have officially ended for the Photon shields. The Photon add-on shields are officially live, and we couldn't be happier! In the Photon line you will find a simple Weather Shield equipped with a variety of sensors, a versatile motion-sensing IMU Shield similar to our 9DOF boards, a Micro OLED Shield that utilizes the same display found in the MicroView, a Battery Shield designed to power your module, a Wearable Shield for your e-textiles project, and a simple ProtoShield. Check out our dedicated Particle Photon Category for a closer and more in-depth look at each board. 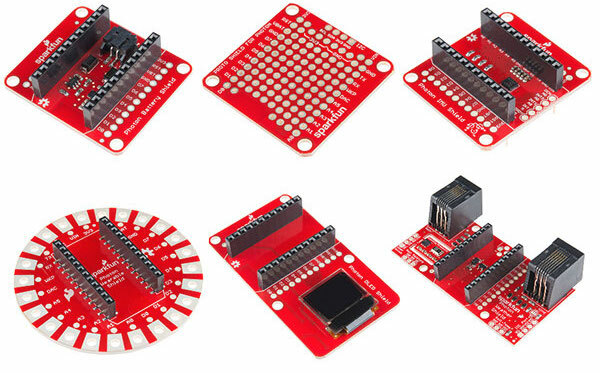 Next up, we have the SparkFun Ardumoto Shield Kit. Ththis easy to use kit is perfect for any interested robot enthusiasts and includes an Ardumoto Shield as well pairs of tires, motors, connectors, and wires. And, of course, it’s all stuffed in a classic SparkFun red box (which may come in handy as a robot chassis itself). That's right, no more annoying plastic clamshell! 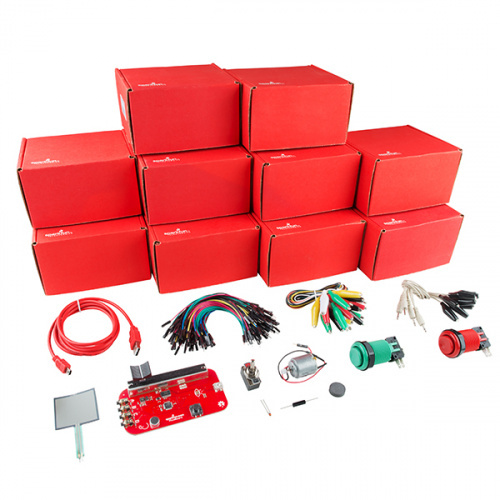 This SparkFun PicoBoard Lab Pack includes 10 complete PicoBoard student kits and other assorted features. Each lab pack has everything you need including the PicoBoard, hardware, and extra components. The PicoBoard allows you to create interactions with various sensors. Using the Scratch programming language, you can easily create simple interactive programs based on the input from sensors. The PicoBoard incorporates a light sensor, sound sensor, a button and a slider, as well as 4 additional inputs that can sense electrical resistance via included cables. Well, folks that's another New Product Friday wrapped up. If you are celebrating this 4th of July we wish you many happy booms and hope you all stay safe. We'll see you next week (hopefully with all of our fingers and eyebrows still attached) with plenty of more new products. See you then! Happy Fourth to everyone at SparkFun! Friday Product Post: Pump Up the Jam!